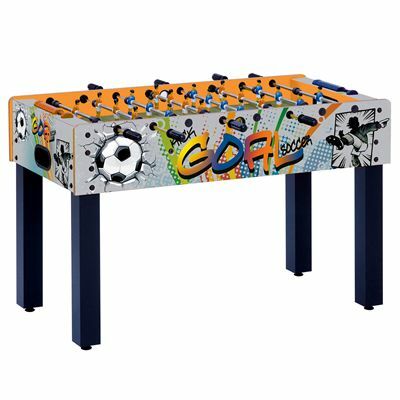 Featuring a funky cabinet painting and plastic laminate playing field, the Garlando F-1 GOAL family football table guarantees countless hours of entertainment during parties and free time. The cabinet is made with 15mm medium-density fibreboard coated with melamine to ensure proper protection from scratching and knocking. The table is easy to use, and includes easy ball recovery system with a pocket behind each goal. There are orange and blue sets of players, as well as fully rotating goalkeepers to add a bit of tactics to the game. For sturdy and stable play on uneven floors, the table offers leg levellers, and comes with a two-year warranty for complete peace of mind. for submitting product information about Garlando F-1 GOAL Family Football Table We aim to answer all questions within 2-3 days. for submitting product information about Garlando F-1 GOAL Family Football Table. We aim to answer all questions within 2-3 days. If you provided your name and email address, we will email you as soon as the answer is published. for submitting product review about Garlando F-1 GOAL Family Football Table.